Anyone who still sees libraries primarily as places to borrow books certainly wasn’t onsite for the opening general session of the American Library Association (ALA) 2015 Annual Conference here in San Francisco last Friday afternoon. It was an event that set the tone for the entire conference for many of us. It reminded us how interwoven libraries and library staff members are with the communities they serve. And it was a perfect way to celebrate the larger events unfolding around us. Those of us arriving onsite early in the day for a variety of preconference activities and informal conversations with friends and colleagues were primed for certain levels of excitement. We were about to see more than 22,000 members of our community from all over the United States and other parts of the world. We knew there would be plenty of festivities centered on SF Pride activities (including the Pride Parade) all weekend. And we knew that ALA staff was doing its usual first-rate job of creating a conference guaranteed to inspire onsite as well as offsite Association members by offering more than 2,400 learning opportunities over a five-day period. We could not, however, have anticipated that we would be together here in San Francisco on the morning that the U.S. Supreme Court ruling on marriage equality would be announced and the afternoon that Roberta Kaplan, a key player in the efforts to achieve marriage equality, would be serving as a keynote speaker onsite. News about the ruling quickly spread around the conference site—Moscone Center—that morning, priming us for a major celebration at the opening session—and Kaplan didn’t let us down with her from-the-heart description of her personal and professional investments in promoting marriage equality. 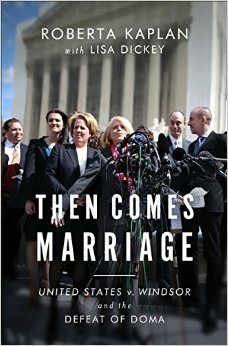 Drawing heavily from the opening pages of her upcoming (October 2015) book (with Lisa Dickey), Then Comes Marriage: United States v. Windsor and the Defeat of DOMA [the Defense of Marriage Act], she recalled the far-from-encouraging moment when she abruptly and unexpectedly came out to her parents. Visiting her in New York City (in 1991) during the weekend of the annual Gay Pride Parade, they were in her apartment as her mother became increasingly, openly critical of the parade and those who supported it. After Kaplan repeatedly, unsuccessfully told her mother to stop offering those unwelcome comments, Kaplan ended up coming out to her parents by responding to her mother’s question, “What’s the matter? Are you gay or something?” with a blunt “Yes,” and then walked out of her own apartment as her mother continued literally beating her own head against one of the walls. The overall story she briefly told us (and which remains available, in part, on the American Libraries website), of how she went from being a closeted lesbian to being the litigator who successfully argued before the U.S. Supreme Court in United States v. Windsor, unfolds nicely and in much more detail in Then Comes Marriage, as many of us who received advance uncorrected proofs of the book at the ALA Annual Conference are learning now that we have time to read it. And the ample causes for celebration that afternoon—and now—included Kaplan’s comment that the entire struggle for marriage equality has left us with something significant to celebrate: our ability to grow and change just as—she noted—her mother has grown and changed in coming to accept Kaplan as a lesbian and, again, a cherished daughter. It would have been difficult to predict that there could have been anything to rival the power and inspiration of Kaplan’s presentation on that particular day, in this particular city. 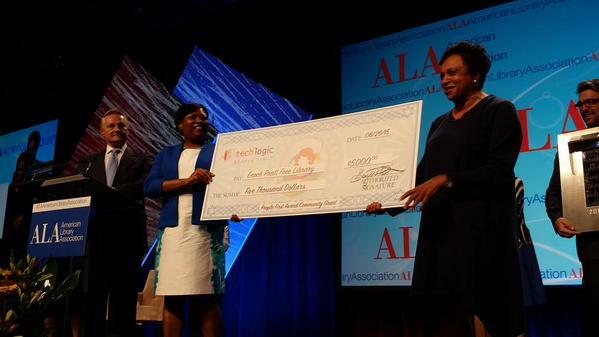 Our ALA staff colleagues, however, managed to find it by concluding the opening general session with the first-ever People First Award, sponsored by Tech Logic and given to the Pennsylvania Avenue Branch of Baltimore’s Enoch Pratt Free Library. Congresswoman Nancy Pelosi and ALA 2014-2015 President Courtney Young were onsite to deliver the award to Melanie Townsend-Diggs (whose extraordinary commitment to the library and her community earned the award) and to Carla Hayden, Chief Executive Officer of the Enoch Pratt Free Library. Tech Logic’s press release captures the thought behind the award: Staff demonstrated “exemplary leadership during several days of riots, which were concentrated at the intersection of North and Pennsylvania Avenues. On April 27, violence ensued after the funeral of Freddie Gray, an African American man who died in police custody earlier that month. As tensions increased and buildings surrounding the library burned, Enoch Pratt Library remained open, providing a safe haven for patrons inside. There’s plenty more to say about the conference and the people who contributed to its success, and I was still thinking about that opening general session a few days later after repeatedly running into and talking with a wonderful colleague with whom I usually have all too little time to sit and chat. As our third extended conversation in one day was drawing to a close, I told him how much I had enjoyed the exchanges we had had, and he immediately responded by suggesting “a 20-second hug”—a concept new to me and that quite literally is nothing more than an embrace that, in lasting for at least 20 seconds, seems to magically slow us down, deliver a sense of comfort and trust, and reminds us that some things—like enjoying the company of those we love—just cannot be rushed. As we reluctantly disengaged from the initial 20-second hug—and then, for good measure, immediately fell into another—I couldn’t help but think about how the interweaving of community, pride, and hugs combined to create a sort of tapestry of what ALA 2015 meant to me and to so many colleagues with whom I have spoken during the past several days. It was also yet another reminder that libraries always have been and always will be about far more than books and other elements of the collections. ALA members and guests came together, worked to be sure we included those who would otherwise have been left behind, and left that conference with an even stronger sense of community and pride than any of us could have imagined having—which is, of course, one of the greatest gifts an association can give its members as those members contribute to the making of the gift itself. N.B. – This is the second in a series of reflections inspired by the American Library Association 2015 Annual Conference in San Francisco. 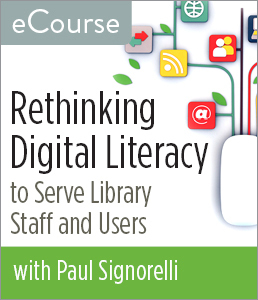 Kudos, once again, to our colleagues in the American Library Association (ALA). Where many professional associations that offer onsite conferences focus their attention almost exclusively on the paying members who are physically attending, ALA’s commitment to use social media tools to include those who would otherwise be left behind is again on display this week. This is clearly an association that is interested in long-term relationships with all its members even if not all of them can support the Association through payment of conference registration fees; expenditures for food, travel, and lodgings; time spent preparing for and participating in conference activities including countless hours of work on committees; and other volunteer efforts that contribute to the strength of the Association and its work. It’s tremendously encouraging to see the various levels at which conference attendees and Association staff members work to support their offsite as well as their onsite colleagues. Dozens of onsite participants set aside at least two or three hours to volunteer as Ambassadors in the Annual Conference program I manage for ALA Membership Development. Available side-by-side with ALA staff members in the ALA Lounge onsite as well as in a variety of conference areas as “Roaming Ambassadors,” they work enthusiastically to answer logistical questions (e.g., where events are taking place, where conference shuttle buses arrive and depart, where coat check and first aid stations are) as well as deeper questions about the Association’s numerous divisions, round tables, sections, and other opportunities for involvement in sustaining the Association and preparing it for its future. A few also contribute resources available to first-time as well as experienced conference attendees. But it’s not just the organized efforts that make this work. Hundreds of onsite participants will reach each other and their offsite colleagues through tweets ranging from whimsical observations to solid 140-character reports summarizing content from many of the more than 2,400 sessions that will be offered while the conference is underway—in essence drawing offsite colleagues into the room and encouraging offsite colleagues to participate through responses as well as questions that occasionally are passed on to presenters so the size of the room extends well beyond what we see here in Moscone Center. 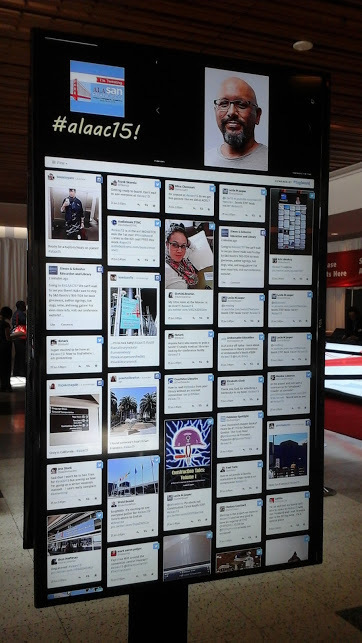 And there are always signs of new innovations: large electronic boards displaying the latest tweets from the conference Twitter feed were, for the first time, spread throughout the conference halls today as if to remind us that part of the conference is happening in rooms housing individual sessions, part of the conference is happening though interactions via Twitter among onsite participants, and part of the conference is happening via the interactions between onsite and offsite colleagues. There seems to be something for everyone, and those of us lucky enough to live here in the city that is hosting the conference are the luckiest of all in that we have already been reaping the benefits of having much-cherished additional time with friends and colleagues who arrived a few days early. Our conversations are magnificent opportunities to share information and to catch up with friends and colleagues we see all too rarely. Our conversations are also the individual moments that, like the bricks in an enormous and attractive structure, serve as the raw materials shaping the vitality of the entire Association itself. I’m looking forward to contributing—via tweets, blog postings, and other online offerings—to the continuing strength and growth of this professional family, and hope onsite and offsite colleagues will do the same so no one will be left behind. N.B. – This is the first in a series of reflections inspired by the American Library Association 2015 Annual Conference in San Francisco. You have searched the Building Creative Bridges blog archives for ‘alaac15’. If you are unable to find anything in these search results, you can try one of these links.